All standard double rooms feature modern design and highest levels of comfort. Quality queen-size beds, beautifully appointed and modern bathrooms, and 43-inch flat-screen TVs combine to ensure a totally relaxing experience. In addition, our conference hotel's 26 m2 standard rooms are all equipped with a desk, safe, tea and coffee-maker, as well as a hairdryer and make-up mirror in the bathroom. Large panorama windows give the rooms a bright and airy feel, making them cosy and inviting. 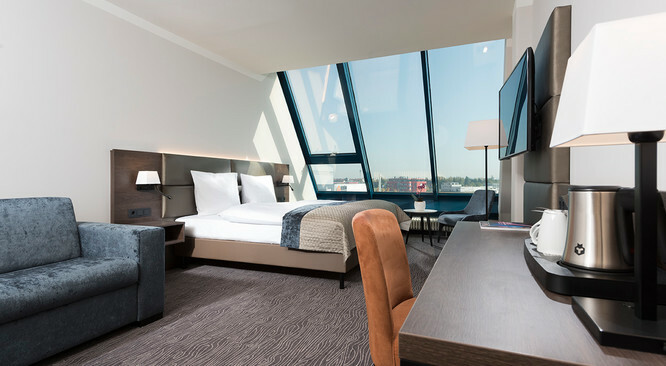 The generous size (average 36 m2) and contemporary design of our superior rooms create an elegant and inviting space, complemented by a soothing colour palette, high-quality materials and large panorama window, all of which combine to ensure your stay is truly special. 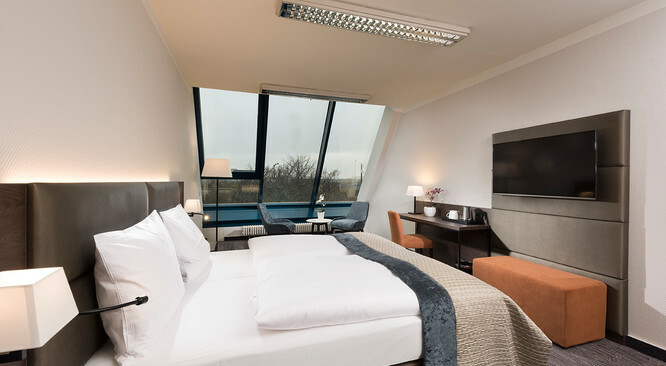 Comfortable 180 x 200 cm beds, 43-inch flat-screen TVs, workspaces, tea and coffee-makers, high-speed WiFi and safes feature in all rooms, while a make-up mirror and hairdryer can be found in the spacious and modern bathrooms. The Excelsior Hotel Nuremberg Fürth's 30 m2 executive rooms are tastefully furnished with high-quality fixtures and fittings. All feature a king-size back-support mattress, Nespresso coffee machine, tea-maker, safe, 43-inch flat-screen TV, high-speed WiFi, ironing station, writing desk, make-up mirror and hairdryer. 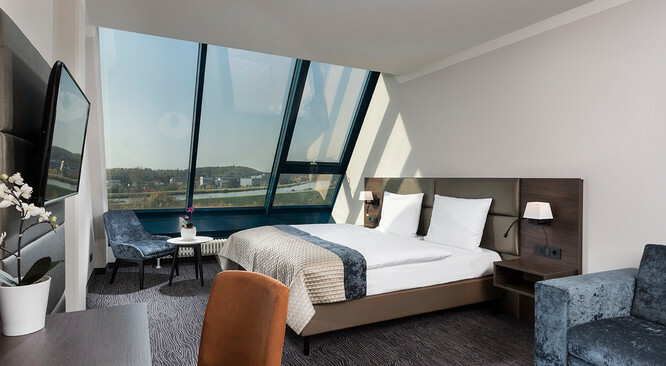 The large panorama window offers an unbeatable view over historic Nuremberg and makes the rooms wonderfully bright and airy. The 36 m2 Deluxe Double Rooms of the Excelsior Hotel Nuremberg Fürth offer first-class levels of comfort in a contemporary setting. Optimum use is made of the generous space, thanks to visually separated lounge and sleeping areas and a comfortable seating area, while the broad window façade creates a pleasant ambiance. To ensure your stay is as comfortable as possible, we also offer free high-speed WiFi, a writing desk, 43-inch flat-screen TV, Nespresso coffee-machine, high-quality 180 x 200 cm bed with support mattress, desk, hairdryer, make-up mirror, iron and ironing board. The Excelsior Hotel Nuremberg Fürth’s Business Suites offer a first-class living experience over 30 m2, with breathtaking views. The carefully-chosen colour palette and modern design elements of the hotel have been carried through to the apartments, which feature: a fully-equipped kitchenette with a Nespresso coffee machine and tea station, cosy seating area, writing desk, high-quality 180 x 200 cm bed, sofa bed, 43-inch flat-screen TV, iron and ironing board, hairdryer, make-up mirror, as well as high-speed WiFi – all of which combine to make you feel completely at home, even during longer stays. Unparalleled comfort, panoramic views and luxurious fittings await you and your family in our Suite Deluxe – a 143 m2 space full of modern design touches and high-class furnishings. You can expect two spacious bedrooms, which are separate from the lounge, a comfortable seating area and work zone, a kitchenette equipped with a Nespresso coffee-machine and tea-maker, an ironing station, a 43-inch flat-screen TV, top-quality king-size bed and high-speed internet. The standout feature of the room is the spacious bathroom with panoramic views from the sixth floor. Here, luxury is assured in the form of a free-standing bath, spacious waterfall shower, separate WC and, of course, a make-up mirror, hairdryer, iron and ironing board. All accessible standard double rooms feature modern design and highest levels of comfort: beautifully appointed and modern bathrooms with a wheelchair-accessible shower and sink, quality queen-size beds, and 43-inch flat-screen TVs combine to ensure a totally relaxing experience. In addition, our conference hotel's 26 m2 accessible rooms are equipped with a desk, safe, tea and coffee-maker, as well as a hairdryer and make-up mirror in the bathroom. Large panorama windows give the rooms a bright and airy feel, making them cosy and inviting. 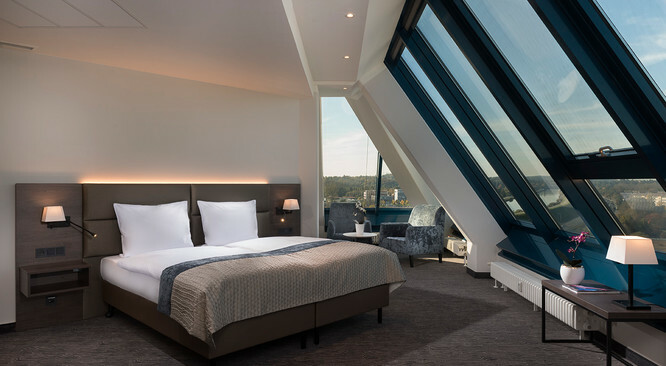 The 104 bedrooms over six floors of the Excelsior Hotel Nuremberg Fürth all offer a stylish interior, highest levels of comfort and excellent service. The warm and inviting colour scheme, modern design and generous layout of the rooms are the result of a complete refurbishment in 2017. 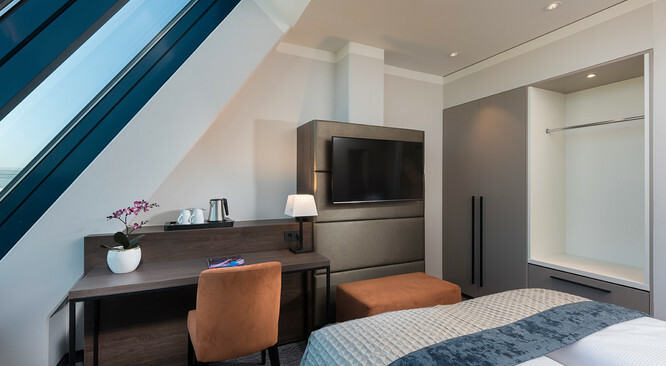 All rooms at the 4 star superior Excelsior Hotel Nuremberg Fürth are equipped with air-conditioning for your comfort, box-spring queen and king-size beds, high-speed WiFi and flat-screen TVs. 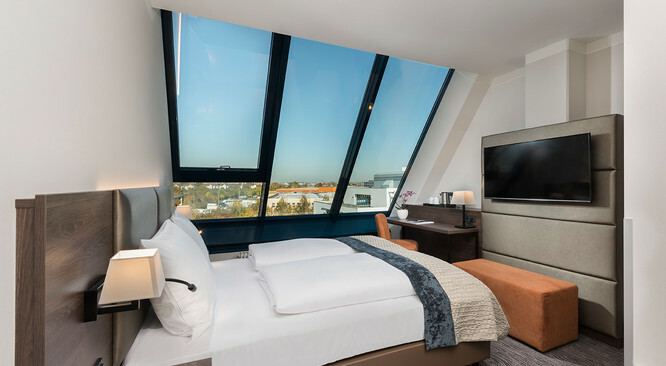 An extra-special feature of the upper floors is the wonderful view over the surrounding region and beautiful Nuremberg. To further enhance your comfort and well-being, we offer a laundry service and free cots for babies, on request. The Excelsior Hotel Nuremberg Fürth has 104 exclusive and stylish rooms available. 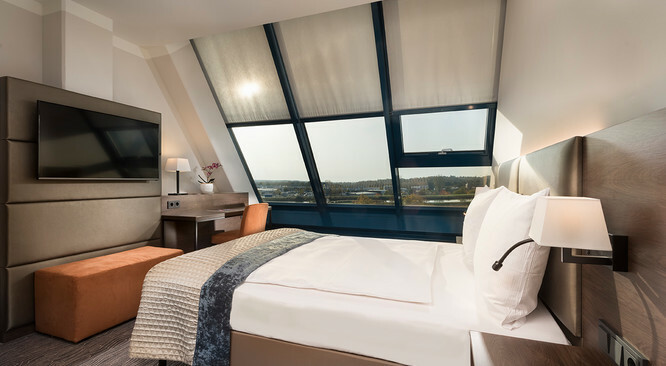 Our well-proportioned, elegant and stylishly appointed rooms meet all the various needs of our guests, while also offering unbeatable views over the surrounding area and city of Nuremberg. The various room categories mean we can meet the individual needs of all our guests, and all rooms feature air-conditioning, WiFi, a 43-inch flat-screen TV and high-quality mattress. In addition, the Excelsior Hotel Nuremberg Fürth offers family apartments, rooms suitable for allergy-sufferers and non-smokers, as well as two rooms specially adapted for those with disabilities. These accessible rooms have a wheelchair-adapted shower and lowered handbasin to ensure our guests with special needs are as comfortable as possible. Getting to the hotel by car is straightforward – each room has a reserved parking space in the hotel’s underground garage.